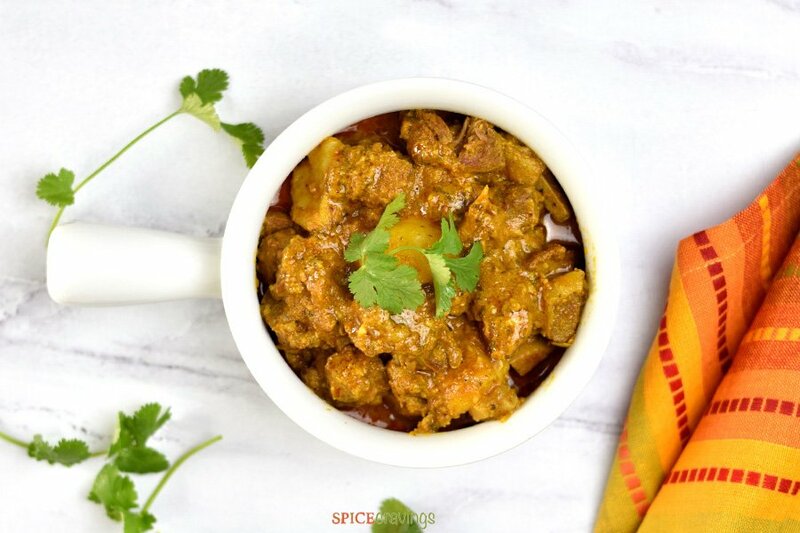 Easy homestyle recipe for Instant Pot Goat Curry or Mutton Masala Curry. Tender and juicy pieces of meat in a yogurt based sauce seasoned with warm Indian spices and crushed fresh cardamom. Serve it with basmati rice and raita and enjoy a hearty Indian meal. 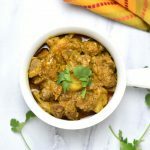 This recipe for instant pot Goat Curryor Mutton Curry, brings back childhood memories for me. Even though my mom has been the head-chef of the house, Mutton Curry has always been my Dad’s speciality. Right from buying the meat, to roasting and grinding fresh spices for it, he totally owns this dish. The result is juicy, tender and delicious meat, which has simmered in aromatics and a yogurt sauce. To me, this will always be the best goat curry recipe! Mutton is the meat of a mature sheep, that is older than a year. However, in the Indian sub-continent, GOAT MEAT is referred to as MUTTON. It is considered to be a lean and healthier meat as compared to beef, pork and chicken since it is low in saturated-fat and cholesterol, and high in iron and protein. What is the Difference between Mutton, Goat & Lamb? I get this question a lot. And not so long ago, even I used to be confused about it. So, let us understand a basic difference! We are talking about two different animals here, SHEEP and GOAT. As per the English Dictionary, LAMB refers to the meat of a young sheep (younger than a year), whereas, MUTTON refers to the meat of a mature sheep. GOAT meat on the other hand, typically comes from an adult goat and tastes milder than sheep’s meat. Why Indians Refer to Goat Meat as Mutton? Goat meat is the preferred red-meat in Indian cuisine. Like I mentioned earlier, in the Indian sub-continent, GOAT MEAT is referred to as MUTTON. I read a couple of articles online which explained that this goes back to the British colonization time. The British, who were more familiar with Mutton as sheep’s meat, referred to the meat shops as ‘Mutton Shop’. So, goat-meat, which is more commonly available in most parts of India, started being called ‘MUTTON’ in India and around. I am sure there are more alternate theories around this, but this is what I found in my research. 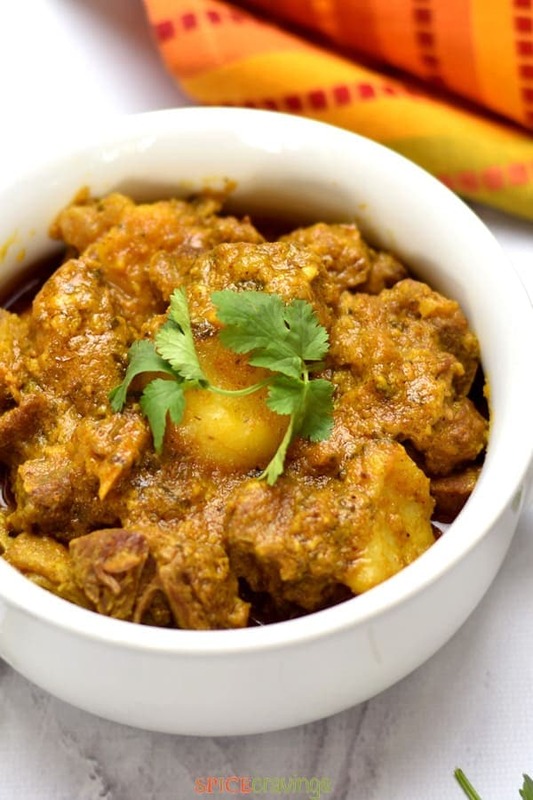 Almost all Indian Mutton Curry recipes use goat meat. Where do I find Goat Meat? Goat meat is not that widely available here in the US. I typically find it in the middle-eastern meat shops, Halal shops, or occasionally at my local Whole Foods. Goat: The pressure cooking time for goat or mutton depends on whether it is bone-in or not, and the size of pieces. It can range between 25-40 minutes. But if you are using roughly 1-1.5 inch pieces, a pressure cook time of 30 minutes is perfect. Lamb: Here in the US, Lamb is more widely available and consumed. Lamb takes around 15-20 minutes of pressure cooking time for 1-1.5 inch pieces. Both meats can be used interchangeably in recipes, if you adjust the cook time. If using Lamb this recipe, adjust the pressure cook time to 15 minutes. 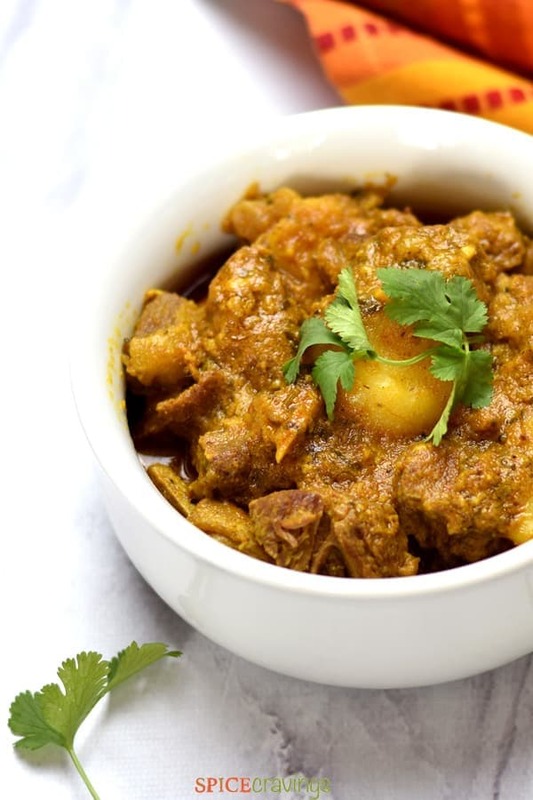 This Indian Goat curry recipe ends up taking a little more than hour from start to finish, but most of it is hands-off cooking time. 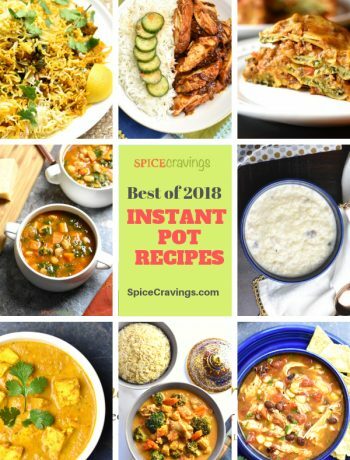 Since goat curry takes about 45 minutes or longer to cook on the stove, I use my Instant Pot pressure cooker for this recipe. It eliminates the need to babysit the pot during the cooking process. Watch the video to see how easy the process is! This recipe can be made in any electric pressure cooker. Just follow the settings for meat and set a 30 minute cook time. For a stovetop pressure cooker like Hawkins, after the first whistle, reduce heat to medium and cook for 15-20 minutes. Marinate the meat: I start by marinating the meat with spices and aromatics (onion, ginger, garlic) and if I have the time, I refrigerate it for 30 minutes. That tenderizes the meat and it absorbs the flavors of the marinade. Saute and Pressure Cook: I saute the meat on high setting for a few minutes. Sautéing helps seal the flavors in the meat. After that I add yogurt and pressure cook it for 30 minutes. Natural Pressure Release (NPR): If I have the time, I let the pressure release naturally. Otherwise, I wait 15 minutes, then do a quick release of pressure. I stir in crushed cardamom to the curry and voila, Homestyle Goat Curry is done! It is possible to make this on the stovetop too, but it would require some baby-sitting. Start with heating a wide bottom pan, like a Dutch Oven/ Casserole or a Nonstick Pasta Pot. Marinate the meat and saute it for a few minutes. Add yogurt and potatoes, stir well, cover it and simmer it on medium heat for 20-25 minutes, or till the meat is tender. You have to keep stirring every 5 minutes or so to prevent the gravy or the meat from sticking to the bottom and burning. 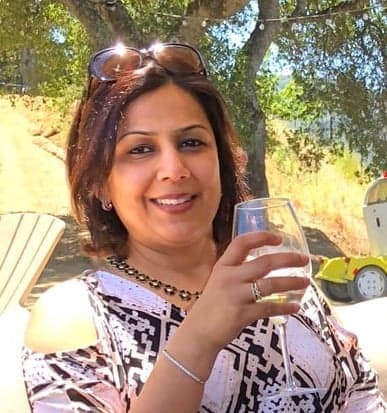 Easy recipe for Goat Curry or Mutton Masala in Instant Pot pressure cooker. 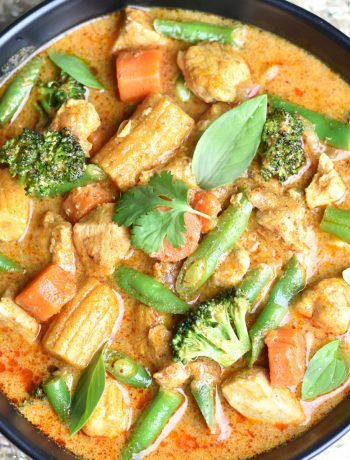 Tender and juicy meat in a flavorful yogurt based sauce that is seasoned with warm Indian spices and crushed cardamom. 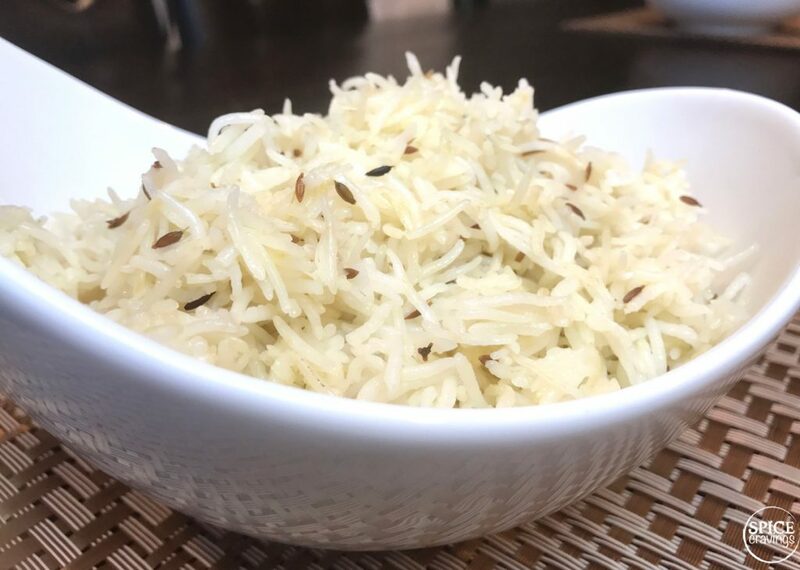 Serve it with basmati rice and raita and enjoy a hearty Indian meal. 1 tablespoon garam masala – For a milder flavor, reduce to 2 tsp. Pat-dry mutton pieces. In a mixing bowl, or a gallon-size ziplock bag (easy clean-up), add meat pieces and all ingredients listed under “Marinade”. Seal the bag and toss it to mix everything well. Refrigerate for 30 minutes to an hour. Heat oil in Instant Pot on SAUTE mode (High). When the display reads “hot”, add the marinated mutton and saute for 3-4 minutes, stirring once in between. Sautéing meat seals the flavors of the marinade in the meat. Add cubed potatoes and whisked yogurt. Whisking yogurt before adding to the pot prevents it from curdling. Stir well and deglaze the bottom of the pan with yogurt, which means scrape off any brown bits from the bottom of the pan. At this point, the yogurt and the meat would have released their juices to make up for enough liquid required to build pressure. If not, add a little water if necessary. Close lid, hit cancel and press Meat mode for 30 minutes (or Manual/Pressure Cook). Set valve to sealing position. Let the pressure release naturally for 15 minutes (NPR 15), release the remaining pressure by turning the valve from ‘Sealing’ to ‘Venting’ position. Open lid after all the pin drops. To thicken gravy, break-up a few potatoes with a wooden spoon or turn on SAUTE mode for 2-3 minutes. Mutton gravy will continue to thicken as it sits, so don’t dry it too much. Marinate the meat as in step 1. Heat a wide bottom pan, like a Dutch Oven / Casserole or a Nonstick Pasta Pot. Saute it for a few minutes. Add yogurt and potatoes, stir well, cover it and simmer it on medium heat for roughly 40 minutes, or till the meat is tender. Keep stirring every few minutes to prevent the gravy or the meat from sticking to the bottom and burning. Cooking time = Time to set for pressure cooking. Total time includes 30 minutes for marination of meat. I’m very excited to have stumbled upon your site, you have so many delicious looking recipes! 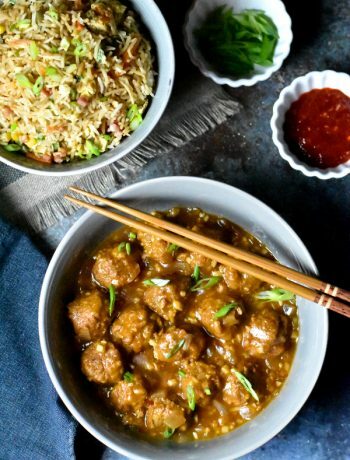 I can’t wait to try making this one, as mutton curry is one of my boyfriend’s favorite meals. My only question, since I’ve never purchased mutton before, is what cut of mutton should I be looking for? Leg? Shoulder? Or does it matter, as long as it’s bone-in? Looking forward to cooking this! Hi Erica, Thank you so much for your sweet words, I am glad you’re here! As for mutton, ‘Leg’ would be ideal. I typically buy a half-and-half of boneless and bone-in. Mutton is basically goat meat, so if you’re having trouble finding that, lamb would be a substitute, just have to reduce the cooking time to 15 mins. Feel free to reach out if you have any questions. Would love to hear how it turned out! Thanks D, so glad you’re trying out my recipes and enjoying them! Few things could have happened. 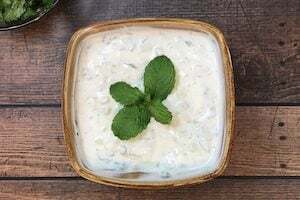 In this recipe, we are depending on two ingredients to release enough liquid required for pressure cooking- yogurt and meat. Maybe, the yogurt was a bit thicker and it didn’t release enough liquid. Sometimes, meat releases different quantity of juices depending on what kind you buy. For example, Safeway chicken releases more liquid than an organic chicken bought from Trader Joe’s. Another possibility is that while sautéing the mutton, something stuck to the bottom and that’s enough to get a ‘burn’ sign. So, try deglazing/scraping the inner pot nicely before closing the lid; another solution could be that you add 1/4 cup or so of water before closing the lid. See how that works. You can always reduce the curry by sautéing after cooking too. Would love to hear how that worked out!